You may want to discuss with your students how this ecosystem type appears to differ from other tropical ecosystems such as tropical dry forests, or savannas, and how it is possible that tropical rainforests on opposite sides of the planet can look so similar while sharing few if any species. Discussing the costs and benefits of very flaky bark as an anti-epiphyte strategy can lead to further discussions about natural selection and adaptation. Tropical rainforest trees are frequently so heavily covered with epiphytes (plants that grow on other plants) that they can suffer structural damage from the extra weight. 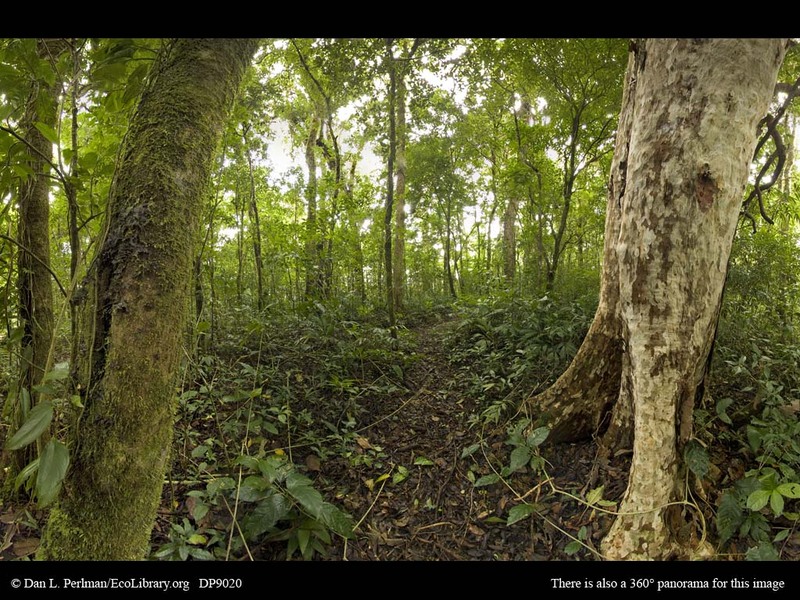 However, a number of tree species have evolved very flaky bark so that they slough off nearly all of their epiphyte load, as seen in this panorama.